← Urine crystals in cats: What causes them and how do you get rid of them? Things happen to our cats. They get injured, or need surgery, and they insist on trying to eat the scabs or chew the stitches out of the healing wound. Your cat is acting on his instinct to stop the discomfort from the wound, which can make things worse. So you have to put him in a cone of shame, which he absolutely hates. Even if it’s a soft cone, he will probably be very stressed during this time. What are some good ways to help him handle it, without risking his recovery? Your cat may have trouble eating, drinking and using the litter box while he’s in the cone of shame. However, if the cone is on properly, he should still be able to do these things. Try putting his food and water bowls up on a little stool or stand so he doesn’t have to bend down as much to get to the bowls. Or simply hold his bowls for him when he wants to eat and drink (if that works for you). Remove any litter box covers you have so that he can move freely inside the box. Also, while it might seem distasteful, you can temporarily put his box in a more open area of the house, again, so that he can move freely. 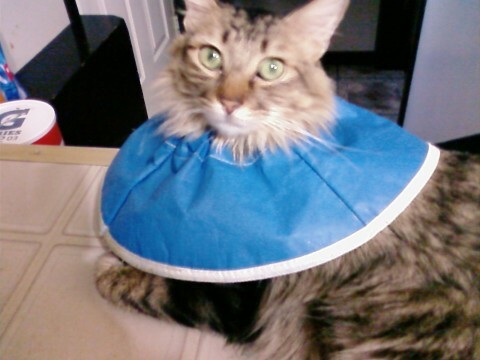 This, too, might help to reduce his stress and feel better while wearing the cone of shame. Everything is more difficult with a cone of shame. Eating, drinking, using the litter box, even getting comfortable and sleeping are difficult. 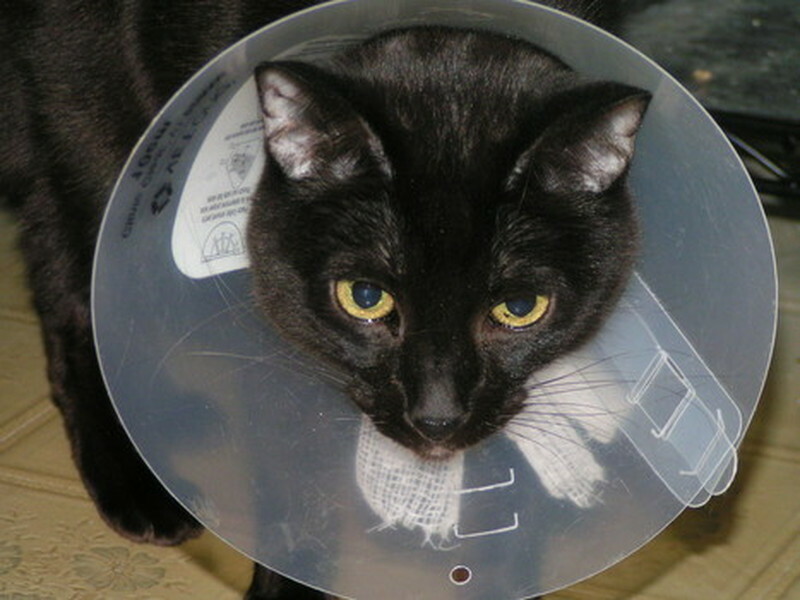 You might start hunting for alternatives—any alternatives—to forcing him to wear that cone. One possible alternative is to put him in a shirt. Shirts sized for babies aged 0-3 months are good sizes for cats and they’ll cover most wounds. This will likely be much less stressful for your cat. However, according to Vetstreet, putting him in a shirt might not be effective on its own, especially if your cat is extremely determined to get at his wounds.You can try a no-lick spray, or some other non-toxic, but icky substance to discourage him and protect his wounds. Other options besides the hard plastic cone include an inflatable or cushioned “donut,” or a neck brace-type appliance. The softer cones are better than the rigid plastic cones, but because they can invert, they don’t necessarily work for all situations. Also, cats can hate the soft cones as much as the rigid ones. You can consider giving your cat supervised time out of the cone of shame, especially around feeding time. However, Dr. Phil Zeltzman says that dogs can be even more traumatized by this, as he might see it as some form of punishment. The same is easily true for cats. Dr. Zeltzman believes that the stricter you are with it, the more quickly he will get used to it. As much as we hate seeing our pets suffer more than we think is necessary, protecting their injuries and incisions from themselves is crucial to their recovery. So, if you’re having trouble with your cat and the cone of shame, try some of these options and see if they help. But don’t just remove the cone and hope everything will be okay.